The principle of self-government through political parties, the cornerstone of democracy, has come to be regarded as a solution to the problem of nationality. This is because the principle of nationality entails the acceptance of the idea of popular government. The importance of the principle of nationality is undeniable, and most of the national questions of Western Europe might be solved in accordance with this principle. Matters are complicated by geographical and strategical considerations, such as the difficulty of determining natural frontiers and the frequent need to establish strategic frontiers. Moreover, the principle of nationality cannot help us where nationalities barely exist or where they are entangled in inextricable confusion. The present work is a critical discussion of the problem of democracy. Michels believes that democracy, as an intellectual theory and as a practical movement, has entered upon a critical phase from which exit will be extremely difficult. In this book he analyzes the tendencies that oppose the realization of democracy, and claims that these tendencies can be classified in three ways: dependence upon the nature of the individual; dependence upon the nature of the political structure; and dependence upon the nature of organization. This edition, described by Morris Janowitz as a "classic of modern social science" and by Melvin Tumin as "the beginning of a tradition," offers a landmark study in political science. 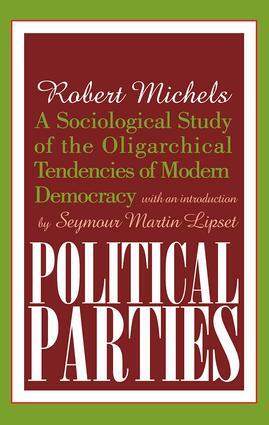 Following its original publication in 1910, the study and analysis of political parties was established as a new branch of science. Political Parties continues to be a foundation work in the literature and is a necessary addition to the libraries of contemporary political scientists, sociologists, and historians.